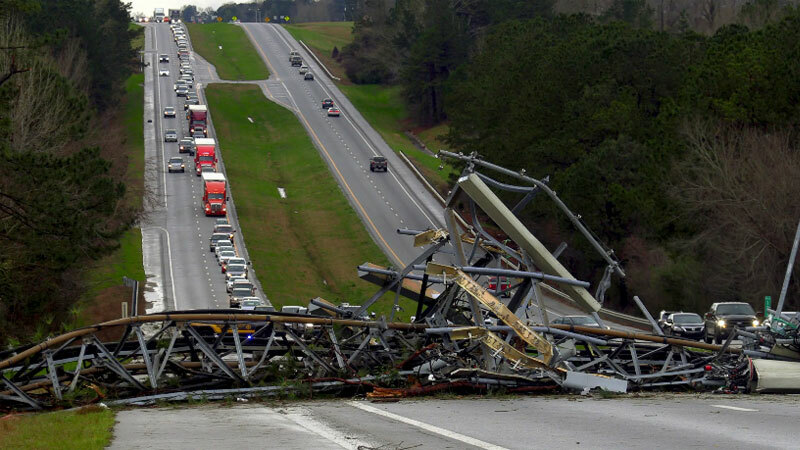 Several tornadoes hit the Southeast of USA yesterday, killing at least 22 people in one Alabama county on the USA's deadliest day for tornadoes in almost 6 years. The death count could rise, Lee County Sheriff Jay Jones told local station WSFA as people are still reported missing. Emergency management officials said crews are searching through debris in the county, about 60 miles east of Montgomery, where at least one tornado destroyed multiple homes. The tornado wrecked an area several miles long and a fourth-of-a-mile wide, Jones told WRBL-TV. Numerous injuries were reported in the community of Beauregard, emergency management spokesperson Rita Smith said, where two deaths were confirmed. Details about the deaths were not immediately available. More than 40 patients went to East Alabama Medical Center, the hospital said. Debris also closed part of Highway 431, according to the Alabama Department of Transportation. After issuing a state of emergency for severe weather on Feb. 23, Governor Kay Ivey extended it statewide yesterday night.